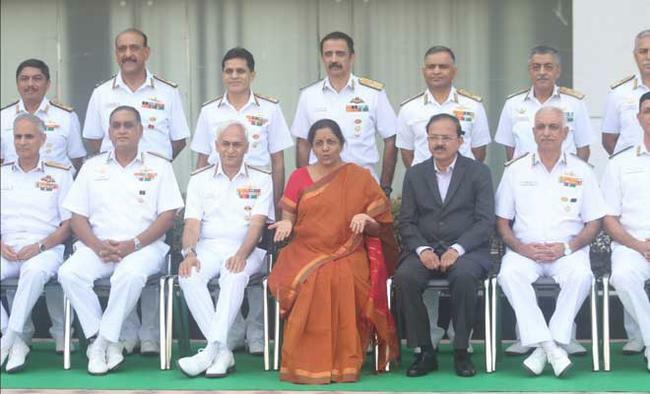 Defence Minister Nirmala Sitharaman, MoS Subhash Bhamre and Naval chief Sunil Lamba during a photo call ahead of naval commanders conference in New Delhi on May 8, 2018. New Delhi: Defence Minister Nirmala Sitharaman on Tuesday said the armed forces should not be blamed for Kashmiri youths joining militants, indicating that there will be no relaxation in the government's tough policy on dealing with violent extremism. "I think we need to understand the issue which is very sensitive with a great deal of nuance. You cannot hold the armed forces responsible for being firm with terrorists. We need to be firm," Sitharaman told reporters here.She was replying to a question if a spike in the number of local youths, particularly the educated, taking to arms in Kashmir was a direct consequence of the government's tough policy in dealing with militancy in the state. Sitharaman, on the sidelines of the biannual Naval Commanders' conference here, said the death of a tourist from Chennai in a stone-pelting incident on Monday in the Kashmir Valley only proved how the armed forces "need to be firm with terrorists and ensure safe movement of tourists". Without mentioning Chief Minister Mehbooba Mufti's recent appeal to the Centre for "compassion and empathy... by engaging in a meaningful dialogue", the Defence Minister recalled how the PDP leader had herself been making passionate invites to tourists to visit the state. "I am sure the Chief Minister has said and has been keen on getting more tourists to Kashmir because that will also help in restoring normalcy. So if that has been the stated desire, for a stone-pelting incident to have hurt and killed the tourist, certainly is not very conducive to that very rightful suggestion of the Chief Minister that we need to have more tourists." She said everything could not be "put at the doorstep of the armed forces". 'The Army has to be firm as regards terrorists. But at the same time I appreciate that we need to have a lot more free moment of tourists, safe moment of tourists so that normalcy can be restored. And what happened yesterday is absolutely unfortunate. "It cannot be accommodative for a tourist to be killed. And I don't know if it was inadvertent or knowingly (done). But it is completely condemnable. "The BJP government, since it came to power in May 2014, has said it would deal firmly with who engage in violence and support militants. In the last four years, some 680 militants have been killed in counter-terror operations in the Kashmir Valley, including 72 in the first four months of 2018, according to data compiled by the South Asia Terrorism Portal (SATP), run by New Delhi-based Institute for Conflict Management. Militancy related violence has also killed 291 security personnel.Some analysts blame the government's iron fist policy vis-a-vis the militants in Kashmir, saying it further radicalizes and isolates the youths caught in a vicious cycle of violence.